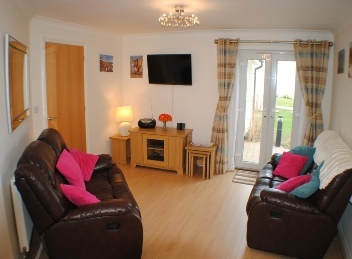 Fistral Retreats self-catering holiday apartment, is a privately owned luxury, modern ‘home from home’ ground floor apartment, on the quieter more desirable Pentire Headland. Great views overlooking the famous Fistral Surfing Beach. A natural choice for couples, families and children, friends, romantic breaks and honeymooners. Two spacious double bedrooms, master has en-suite. Modern and spacious well equipped kitchen and all “mod cons”. Comfortable lounge, 40inch SMART TV, reclining sofas, DVD player and free WiFi. 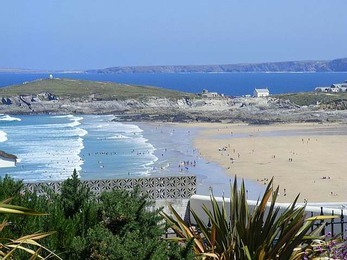 Fantastic views and location for beautiful beaches, buzz of Newquay and relaxation of Pentire Headland and Crantock. Relax in landscaped grounds with amazing views, have a picnic/BBQ. Private off road dedicated parking. View previous guests comments on Visitors Book and on Trip Advisor. Excellent transport links. Newquay airport, train and bus links and taxis all easily accessible. No car required.